'Big Cheese' illustrated at Idiomic.com: definition, example, and origin. Definition: The most important person/ the boss. Example: Sir Bigglesworth-Smythe was a big cheese in the world of moustache grooming products, having created the world’s best-selling tash wax. Big cheese has undergone a series of changes over the centuries. Originally, just a simple ‘the cheese’ meant something top notch. Even the word ‘cheesy’, which now represents something tacky and embarrassing, once meant something of quality. In the early 20th century, big cheese stood for wealth or fame. It wasn’t until 1922 that its current usage came into being. So Iddy, where did this ridiculous phrase come from in the first place? Some attribute it to literal big cheeses created as showpieces in those same years of the 20th century. A truly monstrous cheese was created in 1799 by dairy farmers from Cheshire, Massachussets and sent to President Thomas Jefferson as a gift. It weighed 1250 pounds, was four feet in diameter, and had to be carried in a wagon. Legend has it that it was still being served five years later. That’s a lot of cheese. Iddy’s not sure if this particular fromage gave birth to the idiom, but it’s a great anecdote nevertheless. Some sources claim it derives from a Persian/Urdu word ‘chiz’, which means ‘thing’. It was probably absorbed into the UK English language by returning soldiers in the Victorian age and Indian emigrants in later decades. In this way, the phrase is a corruption of ‘big chiz’ or ‘big thing’. Interestingly, big cheese can be used with respect (though quite informally), or in a sarcastic way. 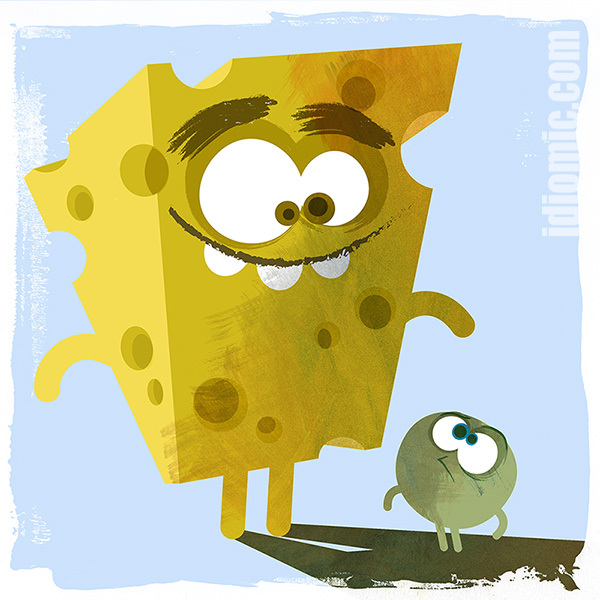 If somebody calls you a big cheese, listen carefully to their tone!